FIRST LEGO League (FLL) teams research a real-world problem such as food safety, recycling, energy, etc., and are challenged to develop a solution. Tomorrow’s innovators practice imaginative thinking and teamwork. 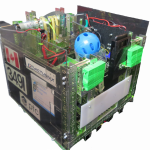 Guided by two or more adult Coaches they must design, build, program a robot using LEGO MINDSTORMS®, then compete on a table-top playing field. Find out about the 2018/19 FIRST LEGO League Season Into ORBIT. We’re planning events and activities in both Victoria and the Vancouver area. Check out the Events page for a list of current dates, times and locations. Looking for an FLL team? Looking for FLL team members? Try the FIRST Forums . From the home page of the forums, scroll down to “FIRST LEGO League Teams” and then to “Starting a Team”. One of the many topics in this sub-forum is “Teams and Team Members in British Columbia”. Post a reply on this topic to announce that you are looking for a team, or that you have a team and are looking for more members. When someone else wants to reply to your announcement, they can do so publicly by posting another reply, or they can send you a private message. You can also “subscribe” to the topic so that you get notified when there is a new post. Contact Us or visit the St. Margaret’s School website for more information about FIRST LEGO League in BC.